The global automotive parts packaging market is moderately competitive owing to the emergence of various organizations going after the market share. The market is in the development stage. The market competition is foreseen to decrease in the span of coming years from 2017 to 2027. To enable customers to improve their revenue in the automotive parts packaging market, this reports gives the detailed insight of the vendor’s landscape. It also provides the data on the items offered by different major organizations. Furthermore, this automotive parts packaging market examination report proposes systems organizations can pursue and prescribes key zones they should concentrate on, so as to take advantage of coming development scopes. The major players working in the global automotive parts packaging market incorporate Mondi Group Plc, Sonoco Products Company Sealed Air Corporation, DS Smith Plc, and Smurfit Kappa. The global automotive parts packaging market was esteemed at US$ 7,143.4 Mn in 2017 and is required to be esteemed at over US$ 10,000 Mn by 2027 end. The market is required to extend at a CAGR of 4.0% as far as market an incentive amid the figure time frame 2017-2027. Boxes and creased packaging items represent essentially high market share. Because of shopper inclination for eco-accommodating packaging and staggering expense of bio-degradable plastic packaging items, creased packaging items are generally embraced in the automotive part and further expected to ascend at a high pace. global pioneers of packaging industry has chance to enter in the China automotive industry and surge with the tremendous scope made with the assistance of exceptionally advanced packaging solutions. With the rises in demand for after sales components and automotives market all over the world, ceaseless innovative work in the packaging sector has fueled the usage of packaging in automobile industry. For example, Sealed Air Corporation propelled Opti NX recoil films in 2016 which have improved tear obstruction properties and empowers the utilization of shrink films on unpredictably shaped items. Innovative improvement in production technique has prompted the adequate accessibility of disposable packaging items. These packaging in automotive segment is boosted by the adoption of practical advancement by various organizations as one of the exceptionally powerful marketing system. These drivers have propelled the growth in global automotive parts packaging globally. 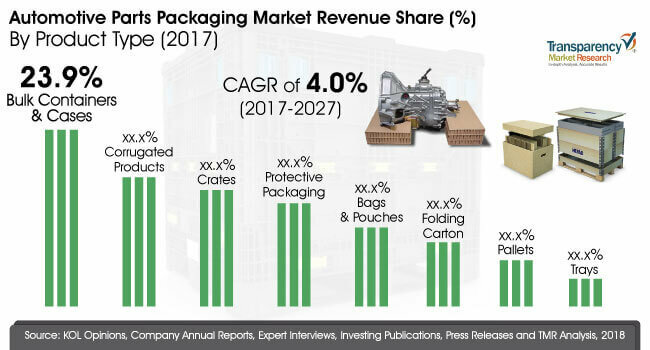 As far as volume, protective packaging is foreseen to account for more than 33% of the global automotive parts packaging market. Large number of protective packaging is consolidated because of high inclusion of delicate electronic and electrical parts required in vehicles. Since, it is for one-time use, vast volume of waste is produced because of protecting packaging. In addition, the manufacturing expense from non-biodegradable plastics is much lower when contrasted with that of biodegradable materials, prompting vast volume of non-biodegradable waste produced all over the world. Corrugated packaging items are high in prerequisite because of high quality, enormous popularity, light weight, and biodegradable nature. Then again, a few regulatory and political barriers have influenced the exchange of pulp for making of corrugated packaging items. These components have influenced the global market for automotive parts packaging.